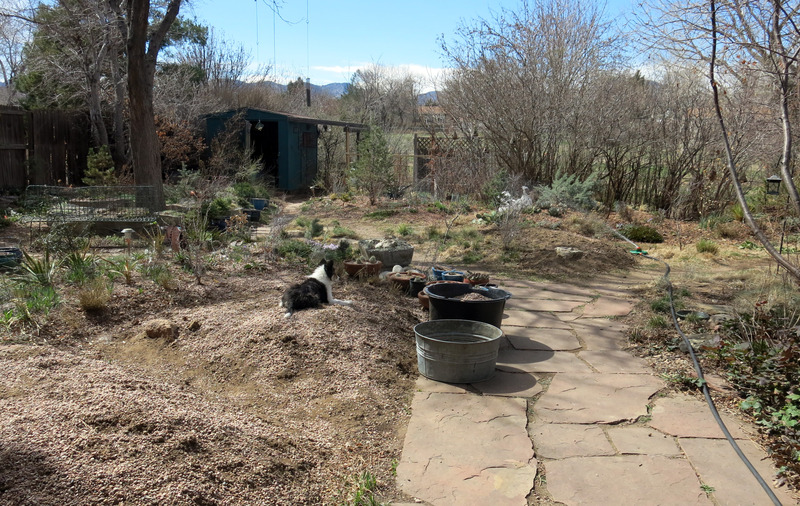 Greetings and salutations, everyone; yes, once again it is I, Mani the less-tiny-than-before purebred border collie, filling in for the guy I live with, and here to bring you some news about our garden. You may remember me from such posts as “A Misty Day”, among at least a few others. Here I am in a characteristic pose. I’m chewing on a pine needle. Rather rustic, don’t you think? You may have noticed, since the last time we talked, that my ears have unfolded and are now gloriously upright. They may have been slightly cuter when folded, but now they are vastly more practical, and very pleasant to touch, or so I’ve been told. 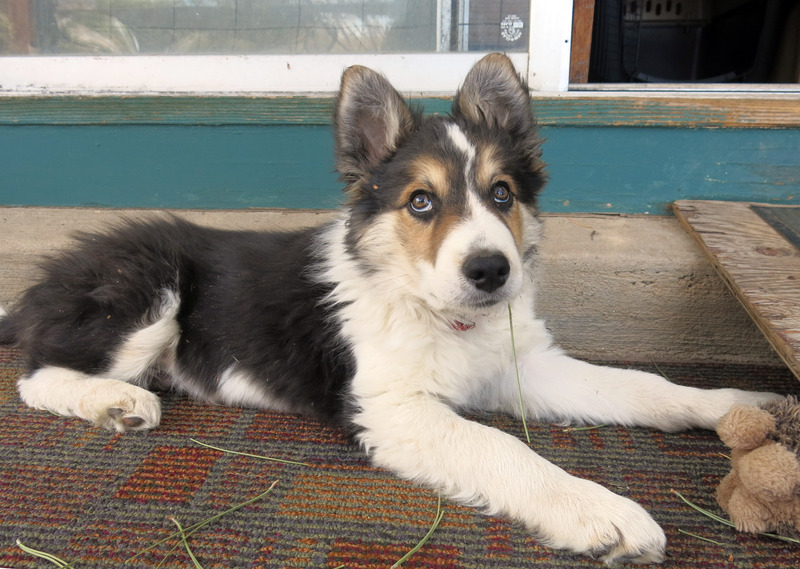 I’m not the first border collie to have lived here who had “radar ears”, as the guy I live with calls them, and so we already know they’re going to be excellent. There are some garden-related things happening, too. It’s a pretty nice day (it’s 60 degrees F, 16C, and fourteen percent humidity), and so the guy I live with took some hellebore pictures. 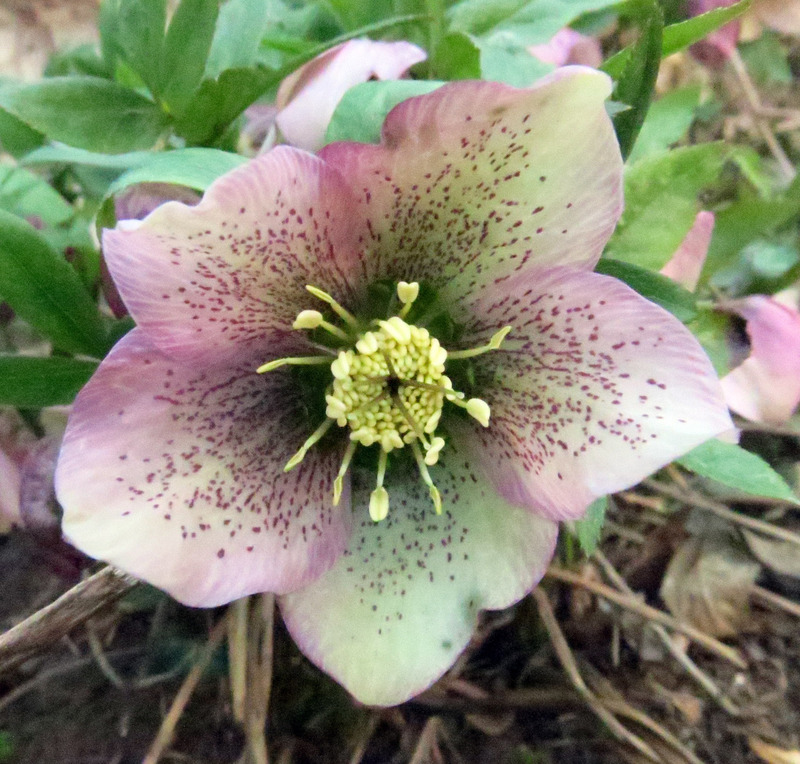 I understand that there are fewer hellebores this year because there was a big hellebore giveaway last year. I’m not allowed to go into this garden, as I discovered today, because hellebores are poisonous, and I might chew on them (I’ve tried practically every plant in the garden so far). I was told that the hellebores are really late this year. Maybe you can see the slightly pink wash on this otherwise white one. And then, pretty much out of the blue, the guy I live with had an idea. It was kind of scary, if you ask me, which he obviously didn’t. Oh, and by the way, you may notice some green grass in the lawn. Believe it or not, except for the one big clump, that’s not supposed to be there. It has to be dug out. Not by me, for sure. I decided that it was better to watch it from a distance. There wasn’t really any point in having the sprinkler, which is what it was called, on, and so it was put away, for “next time”. In other words so I can get scared again. You can see in the picture above that the piles have changed appearance slightly. The guy I live with dragged out that ancient stock tank and says he might make a planter out of it. Or just leave it there as “an object of mystery”. The other thing is a liner for a “whiskey barrel”, which I don’t know about, but I guess like if you wanted to grow water plants in a “whiskey barrel” you would have one of these liners. It holds pea gravel, which you can see, for the “final top-dressing” of the piles, which is going to happen after some larger gravel (not pea) shows up here. Oh, and also, I have had this idea, for several days now, that you might want to see a picture of my excellent “rabbit feet”. 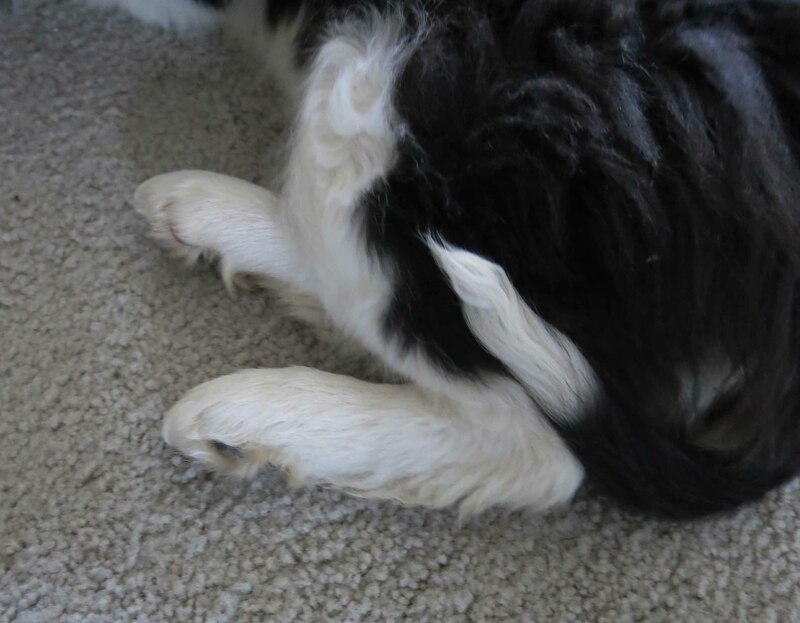 They really aren’t rabbit feet, of course, because I’m a purebred border collie, but the guy I live with, whose sense of humor is boundless (according to him) calls them that. They’re bigger now, because I’m getting huge. Pretty great, huh? It’s perfectly all right if you feel slightly jealous here. That’s about all I have for today. I think it would be appropriate for me to leave you with another excellent picture of me, on the couch, which by the way has turned into one of my favorite places. I’m speechless. The cuteness factor today is more than my brainpan can handle. Thanks; I’ve been working on my cuteness lately. Great video! In no time you’ll be picking that sprinkler up in your mouth, squirting everything and perhaps even the guy you live with. 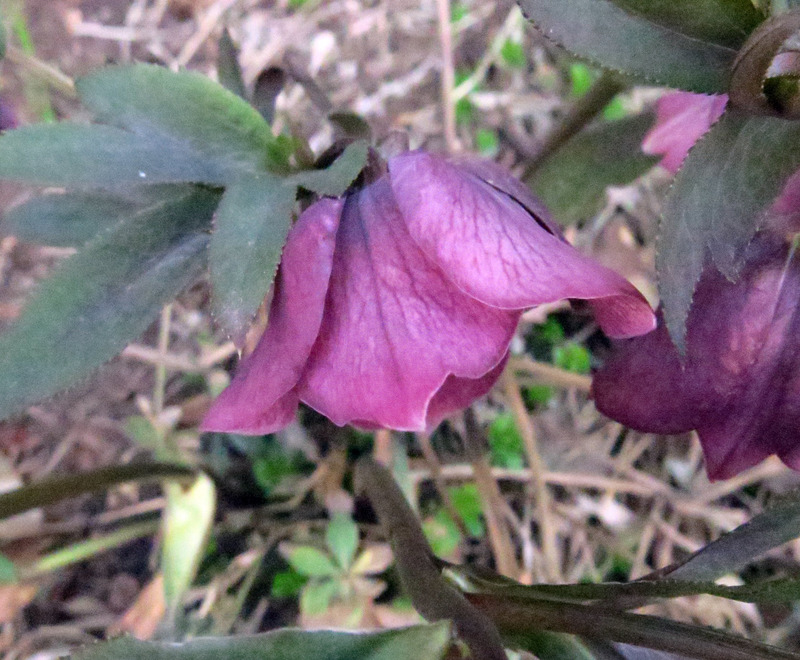 I really like the hellebores too, even though they aren’t cute. I’ve bought several and am eyeing the ones from Northwest Garden Nursery with the lovely markings. It’s warm here, so they are mostly over. Thanks; the guy I live with says that I’d better not be picking up the fancy made-in-Australia gear-driven sprinkler (sold by Garden Talk), but I might have a naughty streak. I got to meet the neighbor dogs today, and, earlier, say Hi to the little neighbor kids. They all liked me. I understand that hellebores here usually start in February but we had that snow that stayed for three weeks instead of leaving, and so the hellebores are late, but he doesn’t care. They reseed like nobody’s business, or so I hear. Oh, those hellebore photos are terrific, especially the last full-on shot. 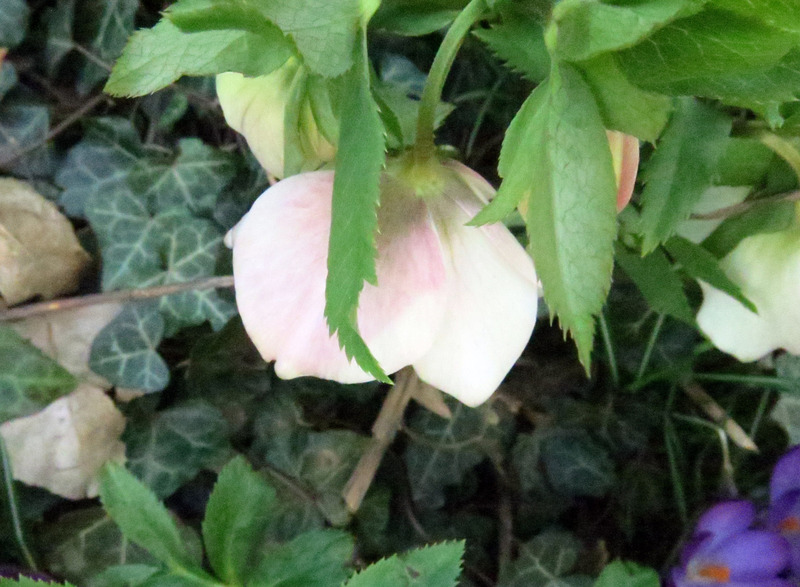 I now find more worthy the hellebore that has survived in my garden. Did we really get to see, Mani, thanks to video magic, your first encounter with a sprinkler? How great! You really do an excellent job of fitting right into that garden, you know, and also the couch. Thanks; Pine Knot Farms has a really good selection. The purple hellebore, “Atrorubens’ maybe, was purchased locally; all the rest are self-sown seedlings. My first encounter with the sprinkler, yes. Pretty scary. The couch is nicer. Since I live with a Siamese with big ears, I appreciate your ears. I love the feet, too. I suspect that in the hot days of summer, the sprinkler will be your best friend. Today was very cold and windy in NYC. It still feels like winter. I envy your spring. Thanks; it’s supposed to rain/snow tomorrow, though not much accumulation. The guy I live with says the water will be okay. He also says the Noodlehead is next. He doesn’t mean me, he means a sprinkler called that. Hi Mani, here in Northern California they are wine barrels. The foldy ears are cute but now you may be creeping into the ‘handsome’ territory . Handsome is as handsome does you know. But you are still damn cute. Thanks; all this saying I’m cute might go to my head. But I still like it. The guy I live with says wine barrels sound pretty good indeed. There’s a full whiskey barrel here (I mean a whole one, not a full one), that the guy I live with’s friend who’s gone now made him buy; it sits in a corner of her little garden now. And a half one that’s full of dirt with no plants. But what the idea of barrels makes him think of, California and all, is Gary Snyder’s poem “Soy Sauce”. Found that poem, thanks. You are making my world a little bigger. You’re welcome; great poem, huh. 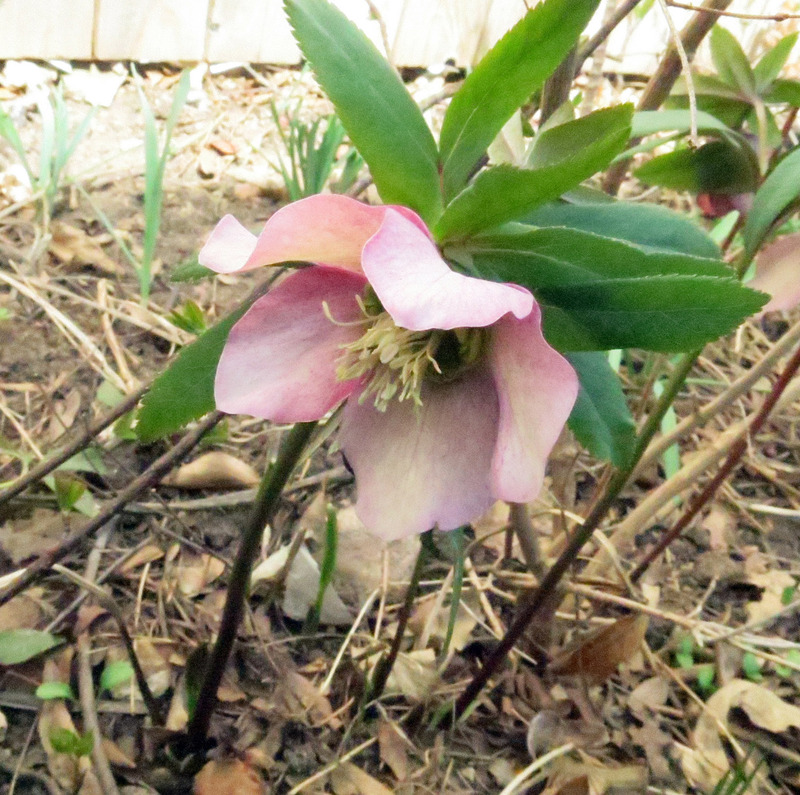 what a treat to see your hellebores ~ mine are still buried under the snow which hasn’t melted yet. can’t wait for them to show, as they are very healthy and two beautiful colors: green and a rosy pink. 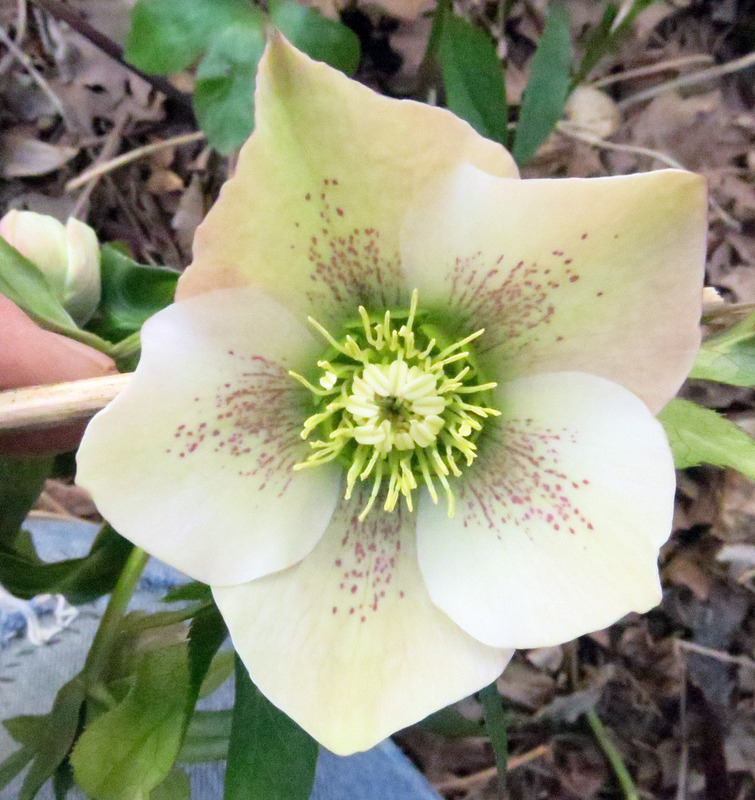 and the best part of hellebores: the deer don’t eat them!! 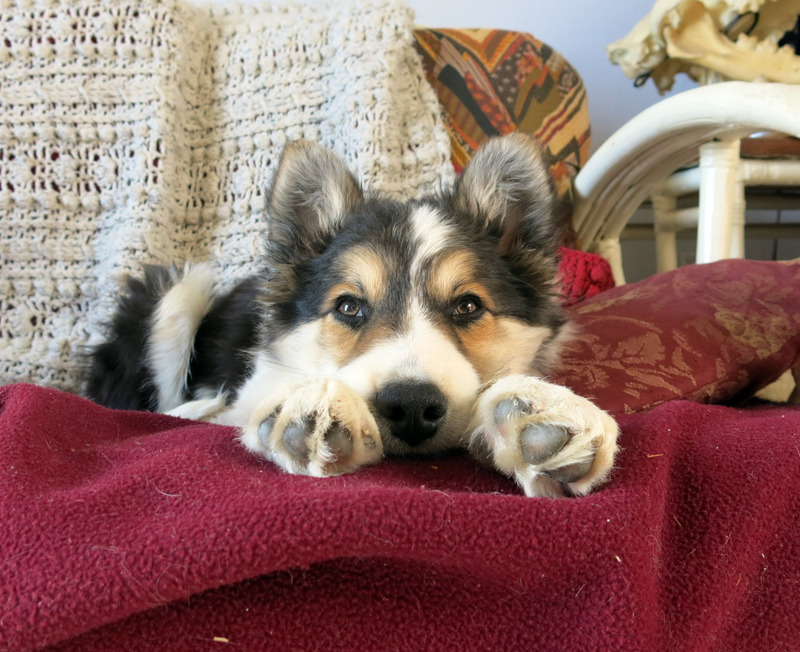 mani, your radar ears and rabbit feet are as sweet as your darling face. Thanks; we hear that “back east” they’ve had quite a winter. It’s snowing here now, though rain and snow, really. March, April, and May are the snowiest months here, though the guy I live with says he’d rather have rain, as a person. As a plant, snow is better, because it takes longer to soak in, but snow often comes with too much cold. Something like that. He complains all the time, so what do I know. The guy I live with draws the line at pronouncing my name “manny”, but, you know, whatever, that’s pretty funny, and no, I don’t mind; I think I weighed 16 pounds (7.25 kg) when I got stuck with needles this past Monday. You can see I’m getting huge. Thanks for the lead to a really great poem! I’m ready backwards so have to refresh my memory about your foldy ears. Sure. I’m getting huger by the minute, and my teeth are getting sharper (I hear I lose those eventually, and get real ripper-gnashers), and I’m also getting better at chasing bunnies, squirrels, and terroizing the flickers who come for the suet, which I lick off the rock garden just to make the guy I live with freak out about purebred border collies eating grease, and getting very good at splashing in the water bowl and soaking the kitchen rug and making the guy I live with say stuff. Oh and I finally got to go downstairs and look around. It was okay. You’re putting those radar ears to good use against that suspicious sprinkler. Keep it up, you can’t ever let your watch down around there. We tiny purebred border collies do have to be on guard at all times. I tried to chew the vacuum cleaner into oblivion, but my attempt was halted early on.